Mature substantia nigra pars compacta (SNC) dopaminergic neurons migrate to their final destination in the ventro-lateral midbrain, and start expressing mature dopaminergic markers such as Pitx3, TH, Slc6a3 (DAT) and Slc18a3 (VMAT2). Dopaminergic neurons in the SNC innervate the dorsal striatum (generating the ‘nigro-striatal pathway) and are involved in the control of voluntary movement. During adult life, their selective degeneration is responsible for the motor defects observed in individuals suffering from Parkinson’s disease. 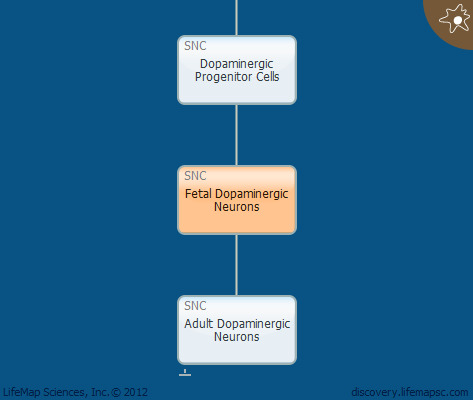 During embryonic life, SNC neurons nonselectively project to both targets, and the refinement of fibers to form the nigro-striatal and meso-limbic pathways occurring at a later stage. SNC and ventral tegmental area (VTA) dopaminergic axons take a ventro-rostral course through the diencephalon towards the telencephalon. Following their exit from the midbrain, individual axons fasciculate into two large axon bundles, called the medial forebrain bundles (MFBs).